Through Bible institutes, regional and local teacher training and church leadership courses, seminars, college and seminary instruction, small group Bible studies, and hands-on practical ministry opportunities, BCM missionaries are training a new generation of Christian leaders around the world. Raising up children’s ministry leaders for the local church is a key focus of ministry in every country where BCM carries out ministry. 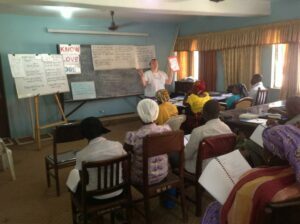 BCM’s teacher training course In Step with the Master Teacher was developed with input from national children’s workers in more than 20 countries—many of them from developing nations. Practical, Bible-centered, and relevant across cultural boundaries, this exciting teacher-training program is the ultimate tool for preparing and training teachers to disciple children as Jesus did: by modeling God’s truth, by building relationships, and by teaching for response. In an interactive CD-ROM format, ISMT offers 22 hours of biblical, integrated teacher training sessions full of creative and practical ideas that can be used regardless of the location, size, or budget of any children’s ministry. Available now in more than 15 languages, it has been used for teacher-training to date in more than 25 countries around the world. Be sure to visit our Ministry Resource Store for more information and to order our material.